Renumbered 886 when donated to Peoria, as the 886 supposedly pulled the last steam train into that city. Shown here at the Peoria diesel shop in 1963, after it was refurbished before moving to a second park there. Bell mounting is not original, but from a scrapped 5100 series 4-8-4. Now at an auto museum in Dunlap. Illinois. And IRM's 938, taken recently. Not very pretty yet, but is in good hands. The 938 spent many years on the grounds of a mental hospital at Enid, Oklahoma, then went to Texas for an aborted attempt at operation before being rescued by IRM. 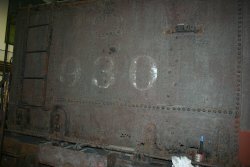 IRM is investigating the condition of 938 Pacific for future operation. Yes, that's right!! Honestly, I'm not really excited. It just doesn't seem like a good use of resources. I had hoped the museum leadership would pursue acquiring the important Rock Island commuter coach #2702. But instead they have opted to pursue yet another steam loco restoration. The museum is an amazing place, but I don't always agree with its priorities. For better or worse, the department czars seem to have supreme decision-making authority, which bugs me a little. Oh well (shrug). It is what it is. And it is an amazing place, so I shouldn't complain. Good luck with the project, IRM. Honestly, I'm not really excited. That's the great thing. As someone who isn't a voting member, not on the board of directors, or a volunteer at IRM, your opinion carries litte weight. I tend to not criticize success. Also, any idea why the 2700s were retired early? Side sill and other structural rot deemed them unsafe. While buying that car might be relatively inexpesive making it safe for operation would likely be a waste of resources. I knew you'd reply with some attitude, Mr Wilkins! I just didn't expect you to get here so fast. Who's to say every car in the collection should be operational and a play-thing for the volunteers anyway? Shouldn't it be about preserving rail history??? I happen to think it's great the museum saved Chgo Surface Lines #4001 (that streamlined car body), even if it will never run -- don't you? I knew you'd reply with some attitude, Mr Wilkins! Just because I do not respond to every bad idea by blowing sunshine up the rear end of the original poster, doesn't mean I have attitude. Shouldn't it be about preserving rail history??? It is and IRM does a pretty good job of it without you or I dictating what they should do from behind a computer screen. Like I said, I tend not to criticize success. Fair enough. They're obviously doing it right at Union. The volunteers are an amazingly dedicated group and the museum is tops in the nation from what I can see. No further criticism from me. I just thought it would be better to alter this list from an unbiased, outsider's perspective. I don't have the proverbial "dog in this fight." Well, I sure would like to see the 2702 preserved. And as I've said before, IRM seems to be the logical place. BUT, I am excited that the 938 may at least be evaluated as a possible restoration candidate. A historically and LOCALLY important piece....to be sure! And since Bob Yarger's original post to start this thread goes all the way back to 2005, here's a more recent photo of the Rock Island 4-6-2. Thanks for the input. I agree with your edits. Location: Lounging back in a parlor chair on the "400"
It might also interest you that the tender on the 938 is actually not the original tender at all, but actually from the sister locomotive 930. - Ryan A.
Gee whiz. Considering that Rock Island 886 at Dunlap, Illinois (originally at Peoria) is really number 887, you don't suppose that 938 might really by 930? I wonder if the folks in Enid, Oklahoma REQUESTED the 938? The folks in Peoria had requested the 886 and the railroad renumbered the 887 to that number. Could it have happened twice? Or the most likely answer, the tenders were swapped during shopping. It's a common occurrence. I can think of 6-8 preseeved steam locomotives that do not have their original tenders. I'm surprised that the IRM would even consider another steam project given that they're working on two other restorations plus maintaining an operational locomotive which requires a good deal of work. Not to mention the cosmetic restoration of the 938. It seems likely that they'd give it a good going over for future reference. I suspect that they'd accept the 2702 if someone or a group would buy it and pay for its transportation and track space at IRM. Any restoration of the Rock Island 938 is at least five to ten years out, for the simple reason that it will take that long to develop the resources to get the work done. You have to start somewhere, and just determining the base line condition of the engine does not assure further action. If restoration does go forward, it would be good for the steam collection, as it will increase the baseline restoration level of the entire steam collection. It also would put four engines (if all were restored/kept in operation) on a much easier and sustainable maintenance cycle (an engine could run for 1472 days solid and still have four years for overhaul while keeping the other three engines running, or whatever--it means better conservation of the other engines, since no one engine has to be used excessively. I would also expect that the Steam program volunteers see growth in their ranks, sufficient to cover restoration/operation of more engines. While I think the Rock Island coach is a historically interesting piece, if there is a limited volunteer interest/resources for it, I'd expect (perhaps demand if I were a member) that they take care of existing resources first, before going after another car without resources (money/barn space) in hand. If the 938 gets repaired and under steam again it would be great for the museum like the person said above of me to have different engines so not to wear one out completely. The even better part of this would be the possibility of having an "Excursion special" from downtown union station out to Union itself with the capone cars as with the engine IRM would have an old fashioned commuter train from Chicago.